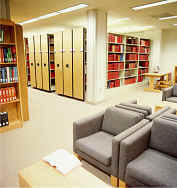 Think of our team for mobile shelving in your storage areas. 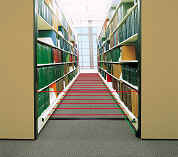 Spacesaver Mobile shelving costs less than filing cabinets and increases capacity 300% in the same floor space. Spacesaver industry leading safety features on Mobile shelving systems can save your company in more ways than just space. 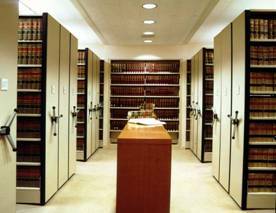 All mobile shelving units are designed by Southwest Solutions Group to be American Disabilities Act (ADA) compliant. Spacesaver Mobile shelving units set atop rail systems in or on the floor and travel back and forth to save space in crowded file/storage rooms. The right mobile shelving system can make all the difference in the world for your company. Mobile shelving systems can eliminate the cost of off-site storage and allow you to keep more on hand in the space you are currently using for your shelving or cabinets. 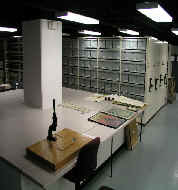 A Mobile shelving units for library storage area in Dallas, Texas. Let our team assist you in to increase storage capacities by a tremendous amount. 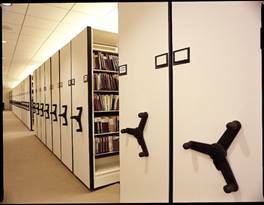 Mobile shelving units can be installed and driven by manual crank systems (shown to the left) or by electronic motors as shown in picture above. A free Mobile Shelving Analysis can be performed by requesting it using our contact form. Anything can be stored from microchips to fire hose mobile racks, including medical supplies . Mississippi – Jackson, Hattiesburg, and many other locations in Mississippi. Louisiana – New Orleans, Baton Rouge, Shreveport and many other locations in Louisiana. Southwest Solutions Group, Inc. is a conglomerate of multiple companies that have been purchased. There also have been other dealers in certain cities that are no longer dealers for Spacesaver. 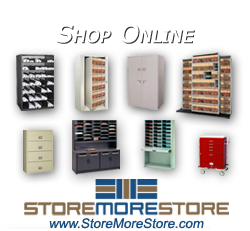 Southwest Solutions Group is the exclusive Spacesaver shelving company in Memphis, Tennessee (formerly the Spacesaver dealer was Kreager Systems, and formerly Associated Office Systems, and formerly J.L. Shelton &Associates). Contact us at 901-202-0480. 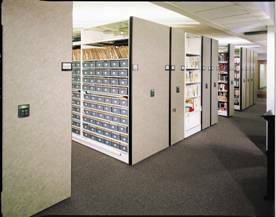 Southwest Solutions Group is the exclusive Spacesaver shelving company in Little Rock and Fayetteville , Arkansas (formerly Kreager Systems, Associated Office Systems, JL Shelton & Associates). Contact us at 501-859-0675. Southwest Solutions Group is the exclusive Spacesaver shelving company in Oklahoma City and Tulsa , Oklahoma (formerly Systematic Solutions Company, formerly File Systems Inc., formerly Resource Office Systems, and formerly Storage Systems Inc. in Oklahoma ). Contact us at 405-879-3448. Southwest Solutions Group is the exclusive Spacesaver shelving company in Wichita and Kansas City , Kansas (formerly Systematic Solutions in Oklahoma ). Contact us at 405-879-3448. Southwest Solutions Group is the exclusive Spacesaver shelving company in Dallas , Ft Worth, Temple , and in the western part of the state in Lubbock and Amarillo , Texas (formerly Southwest Spacesaver Systems, LJ Fleming &Associates, Records Management Systems RMS, in Dallas ). Contact us at 800-803-1083. Southwest Solutions Group is the exclusive Spacesaver shelving company in Austin, San Antonio, Houston, Corpus Christi and The Valley, Texas (formerly Texas Spacesaver in Houston, formerly NB Business Systems in Houston, NB Shelving in Houston, NBBS in Houston, NB Label in Houston, Spacesaver of Texas in Houston, and formerly Records Systems Inc. in San Antonio ). Interstor Shelving is not the authorized Spacesaver dealer in Texas . Contact us at 800-803-1083. Southwest Solutions Group is the exclusive Spacesaver shelving company that purchased Advanced Filing Systems and Automated Filing Supplies. Contact us at 800-803-1083.